LOS ANGELES -- After testing the nerves of engineers, NASA confirmed Friday a tiny satellite unfurled an ultra-thin solar sail, a technology that has far-reaching applications both near Earth and in deep space. Project officials have "multiple confirmations" of a successful sail deployment, according to Dean Alhorn, the NanoSail-D mission's project manager at the Marshall Space Flight Center in Huntsville, Ala. The 8.5-pound spacecraft, NASA's first solar sail mission, transmitted a beacon signal indicating it attempted to release the sail, which measures 100 square feet and is made of a polymer material called CP1. The membrane is about 3 microns thick, tens of times thinner than a human hair. Not only did engineers get a positive beacon signal from the spacecraft, but ground-based observers reported they saw a different signature from the satellite as it passed overhead. "That signature is consistent with the size change we would normally see if it deployed," Alhorn said Friday. "What they saw was significant enough for us to have a high confidence that we did deploy the sail." The deployment occurred around 10 p.m. EST Thursday, according to NASA. The membrane was wound on a spindle inside a triple CubeSat spacecraft about the size of a loaf of bread. Four spring-loaded guide booms were designed pop out of the compact spacecraft, then the polymer membrane was supposed to stretch tight in a diamond shape within about five seconds. That's if the sail deployment went as planned. This week marked a significant turnaround for the NanoSail-D project. Officials were growing concerned over the spacecraft's silence after its scheduled deployment from a mothership satellite named FASTSAT. 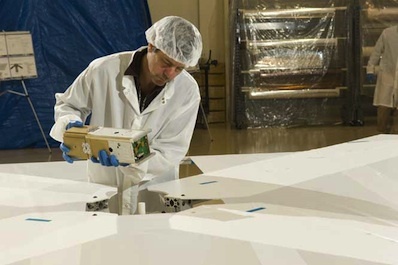 NanoSail-D launched Nov. 19 inside FASTSAT, a NASA technology demonstration satellite. The craft was programmed to compute a time to release NanoSail-D, but officials never heard from the miniature satellite after its scheduled Dec. 6 separation. Telemetry indicated FASTSAT commanded separation of the subsatellite and the container's door opened, but NASA couldn't find NanoSail-D, leading officials to believe it was stuck inside its carrier. "When it was stuck inside, it was very depressing after working on this for three years," Alhorn said, adding there is no definitive answer for why the craft failed to deploy on the first try. More than six weeks later, FASTSAT radioed Earth that it released NanoSail-D. The deployment was spontaneous, according to NASA. Alhorn said NanoSail-D's battery will be drained over the next few days, so the satellite's beacon signal could die soon. Amateur ham radio operators around the world are listening for radio transmissions from the satellite. But there is still an opportunity for visual observers to catch a glimpse of the satellite. Although officials expect NanoSail-D to be dim for most of its mission, brief flares in brightness could make it visible to the naked eye. The spacecraft is tumbling right now, Alhorn said, but atmospheric drag in low Earth orbit should stabilize the sail's attitude like a kite. Officials expect NanoSail-D will remain in space between 70 and 120 days until it eventually succumbs to drag and burns up in Earth's atmosphere. The uncertainty depends on solar activity, which can increase drag for low Earth orbit satellites, causing them to lose altitude. NASA is calling upon satellite watchers to track the satellite and take pictures. The best time to view the craft is around dawn and dusk. When the sail is tumbling, it could be visible anywhere in the sky, but once its orientation stabilizes, the best viewing will be when the satellite is close to the horizon, according to NASA. Observers can enter their location to find sighting opportunities for NanoSail-D.
Because the sail is flying just above the atmosphere, drag is the largest force acting upon the spacecraft. NanoSail-D's primary objective was to deploy the solar sail and re-enter the atmosphere, not perform any complex maneuvers or flight tests. "We actually did what we said we were going to do," Alhorn said. "We hope, if there's enough solar thrust, we might be able to see how much power this design can get." Solar sails work by harnessing the pressure of sunlight. Units of light called photons generate miniscule levels of thrust when they collide with a solar sail, much like a kite or sailboat responds to wind. They don't generate much thrust, but sails can propel lightweight spacecraft long distances into the solar system on timescales much faster than chemical rockets. A Japanese solar sail mission, named Ikaros, successfully demonstrated solar sailing on the way from Earth to Venus last summer. NanoSail-D's potential applications are closer to home. NASA and the U.S. military are interested in inexpensive methods of removing retired satellites from clogged traffic lanes in orbit. The military tracks nearly 16,000 objects larger than 4 inches circling Earth, and even small debris moving at high speeds pose serious threats to active spacecraft. DARPA, the Pentagon's research and development agency, is studying concepts to pull debris and old satellites out of operational orbits. Such a job is technically challenging, but legal and political hurdles loom even taller, according to experts. Low-cost CubeSat spacecraft like NanoSail-D could prove solar sails can be packed inside canisters like parachutes, providing a disposal system when satellites are finished with their missions. Over time, sails could slow satellite velocities enough to move the craft to graveyard orbits or into the atmosphere for a destructive re-entry. "It's possible we could use this sail in the future, or some system similar to it, to aerobrake or de-orbit existing satellites," Alhorn said. The spacecraft cost about $250,000 to build and test, according to Alhorn. 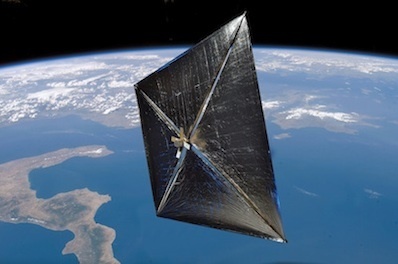 NanoSail-D was originally scheduled to test Alhorn's solar sail concept in 2008, but the CubeSat was lost in a rocket mishap. NASA had built two NanoSail-D spacecraft, so the agency sought a launch opportunity for the ground spare. The U.S. Air Force provided a Minotaur 4 rocket to launch FASTSAT, NanoSail-D and a cache of military payloads from Alaska in November. "It looked like this thing was going to never going to work," Alhorn said. "But when we got a launch, we were happy. Then it didn't come out, and it was a another disappointment in a long chain of solar sail failures. But lo and behold, it ejected on its own."